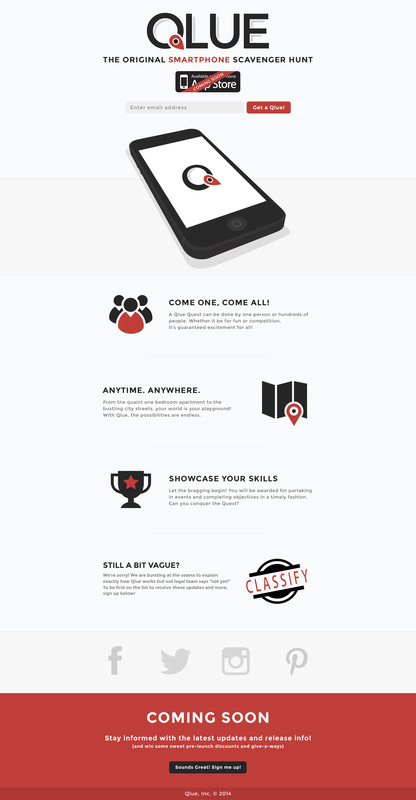 Responsive launching soon One Pager with a red, white and black scheme for ‘Qlue’. Unless I’m missing something I find it annoying how the website doesn’t actually tell you *exactly* what Qlue is? Qlue just recently began our pre-launch campaining through social media. The response has been phenomenal, so we decided to build this quick landing page right away. It was designed and developed in one day's time between a small team of two designers and two developers. The design was redrafted several times until we were 100% satisfied, making it a long day of work. There are no hidden sections, per say, but the bottom email capture button pops out a fun box with immersive copy. We hope you enjoy the first rendition of the Qlue website, and there will be many more to come.